I'm a little bummed tonight because my left thumb nail has a crack below the quick, and I think the only way to really fix it is to go to the nail salon tomorrow. I don't think I can bear it breaking now, it's too far down and I know it's going to hurt! Other than the salon or the teabag method, do you have any recommendations for a cracked nail? If you're looking for a Valentine themed polish, you're looking at the wrong place. I don't have anything pink or red, but I do have a polish that I'd like to make as my Valentine! 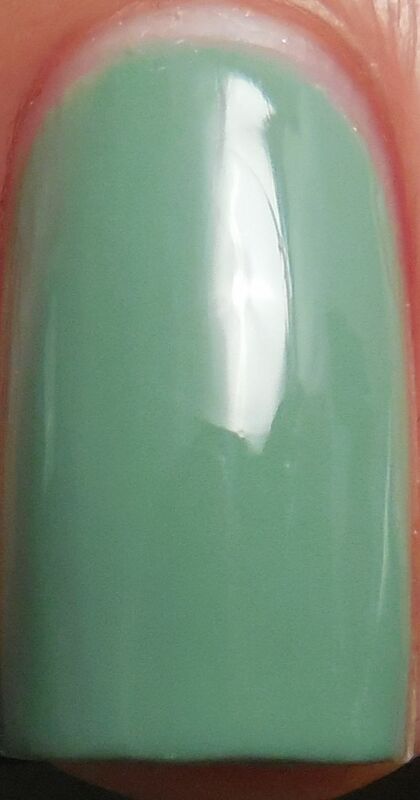 This is a spring 2013 limited edition release by Yves Saint Laurent called Jade Imperial, and I luurrve this polish! I adore the dusky jade shade of this creme, and the application was buttery smooth and self leveling like other the YSLs that I've tried before. Below is two coats with a layer of SH Insta Dri to help with dry time. I think it's my favorite shade for spring so far. I had trouble finding it but I think it's now on Sak's website and will be available on Nordstrom's website with free shipping around the 22nd. You definitely have to snag this LE color before it's all gone! Thanks so much! I love jade colored polishes! Oh wow. That is beautiful!